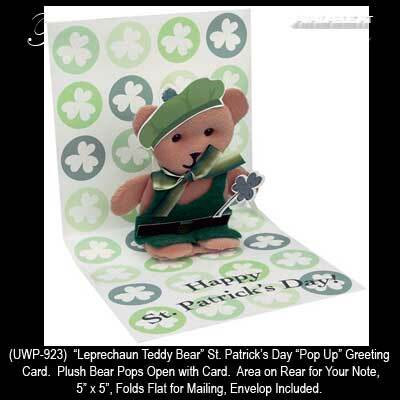 This St. Patrick's Day card is a pop up design with a plush Irish Teddy bear. When you open this St. Patrick's Day card an Irish Teddy bear pops up. The plush Teddy bear is dressed as a leprechaun and there are shamrocks abound. This pop up St. Patrick's Day card from The Irish Gift House measures 5" tall x 5" wide and has an area on the back for your personal message. The Irish card folds flat for mailing and the envelop is included.